Recently I've been walking through Priscilla Shirer's Jonah study. I am not typically a workbook kind of girl, but a dear friend sent me this one with the notation to take little notice of the busywork and to "bring your own depth". Wry smile. I was in need of some sort of study to help me return to the discipline of quiet time - as I've said here before, time with the Lord takes on a new look and feel with a toddler and barely two years in to parenting, I still feel the weight of loss at times. The loss of quiet and worship as I knew it before God made me into a mother. This study has been a good tool for me over the past month, to return to some semblance of rhythm and stillness before God and while I definitely find myself skipping the busywork, I am profoundly moved by the story of this prophet. During week three, the content was centering on the issue of obedience as a full and immediate response to the Lord. Shirer uses the phrase "there are no shortcuts with God" to emphasize the importance and value of choosing complete obedience. She writes, "our heart must be set on doing God's will-- His way and in its entirety--even if it takes longer than we'd prefer or requires more effort". I've written some previously on the idea of choosing obedience and the at-times painful reality that obedience doesn't mean we get our way in the end. We don't obey to get results, we obey because the truth of God confronts us and His love leaves us no other choice. Obedience is like gratitude and patience and affirmation and grace — it requires discipline. It was not a new verse or even a new idea in the context of obedience. But this time, the Spirit illuminated something I had not considered. Food is delightful. We take food regularly and with pleasure and purpose. When we go without food, we become weak. It sustains and nourishes a body. Jesus' nourishment and sustenance and delight was obedience to the known will of God, even to the point of death. Jesus Himself, the very Son of God, was sustained in His earthly body by choosing to fully participate in the Father's work with complete obedience. Okay, is this registering the same way for anyone else? JESUS WAS NOURISHED BY OBEDIENCE. He was SUSTAINED by obeying God, even though the known will of God included betrayal, grief, excruciating beatings, false accusations, and death by crucifixion. Y'all, this hit me so hard. One of the things Shirer points out is that our human response is often "to find another route to accomplish what God requires, [one] that won't take as much effort or energy as we will have to expend to obey God completely". And she's so right. I've spent a good part of the last three months grumbling in my heart and leveling judgment on several things God has submitted our family to in this season of life, because they are just not what I had in mind. And I have felt frustrated in several areas of personal discipline, disconnected in relationships, and malnourished in spirit. And here, in the person of Jesus, I see the remedy in a new light: obedience will nourish me. I may not have all the answers, I may still desire more details than God chooses to give me about His purposes, and I may (as I have) grumble and whine and delay my obedient response to Him. But now I have a powerful new motivator for choosing obedience: it sustains my heart and nourishes my spirit, that I may "gain Christ and be found in Him". 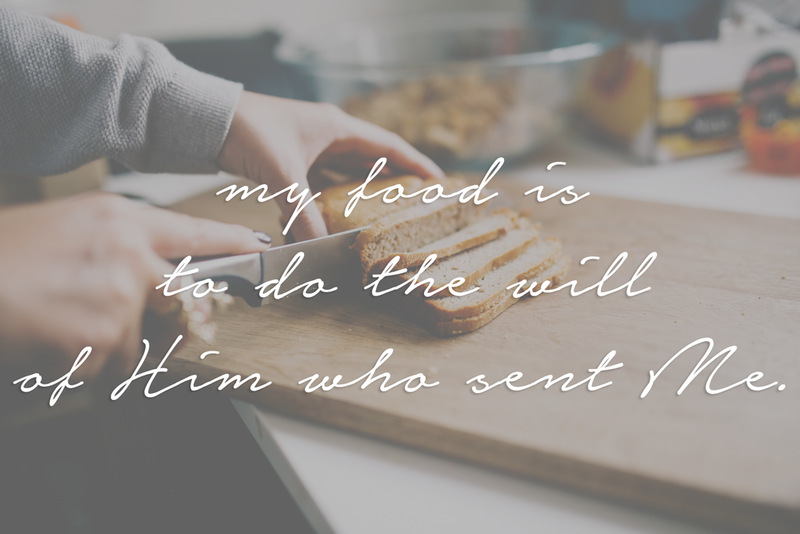 If Christ is indeed my life, then choosing to obey the will of Him who sent His only begotten becomes my food as well. And while I must exercise some degree of discipline, I do not have to conjure obedience on my own, for the Spirit of the Living God indwells me, compelling me through His love and tenderness to obey.